Noah's Ark (Hebrew: תיבת נח, Tevat Nōakh; Arabic: سفينة نوح, Safīna Nūḥ) was the immense vessel that God told Noah to build, as recorded in the book of Genesis, chapter 6. The Ark fulfilled its purposes to save Noah and his family from the global flood and to preserve mating pairs of every kind of terrestrial animal. Popular conceptions of the Ark have varied with the culture. In the early days of Western shipbuilding, artists depicted the Ark as resembling contemporary ships, though such portraits were typically inconsistent with either the size or the proportions of the Ark. The most accurate portrait during the Renaissance was that made in 1675 by Athanasius Kircher, who depicted a rectilinear Ark. Sadly, nineteenth century scholars under the influence of secular scientists like Charles Lyell and Charles Darwin began to take the Flood story less seriously. Artists then began to depict the Ark in a manner befitting an illustrated children's book. A typical portrait of the Ark, even in church windows, gave it the shape of a claw-footed bathtub surmounted by an over-sized pilothouse with a gabled roof. In 1961, John Whitcomb and Henry Morris published The Genesis Flood, the landmark work that ignited the modern creation science movement. In that work, Whitcomb and Morris discussed the Ark and emphasized its carrying capacity and hypothetical seaworthiness. Shortly after this, a number of witnesses came forward claiming to have climbed Mount Ararat in modern Turkey and actually seen the Ark, or spoken to those who had. All the putative witnesses described an immense rectilinear structure, though they provided few details of its size and proportions. Artists now began to depict the Ark as a simple rectilinear solid. The most famous such painting was by Elfred Lee, who in 1985 painted the Ark as a long barge surmounted by a ventilatory superstructure running the entire length of its roof. The artist claimed that he based his illustration on the testimony of one George Hagopian, who died in 1972 after granting multiple interviews in which he described to Mr. Lee what he had seen. The Ark need not have been designed as a ship. It would not have required propulsion, a navigation system, or even anchors. Its purpose was to keep its passengers safe, possibly leaving their course and ultimate destination completely in the hands of God. The book of Genesis describes Noah's Ark as a wooden vessel 300 cubits long, 50 cubits wide, and 30 cubits high. Based on the shortest estimated length of the cubit, this means it was at least 450 feet (135 meters) long, 75 feet (22.5 meters) wide, and 45 feet (13.5 meters) high. (If long cubits are assumed, these dimensions increase to 516 ft by 86.0 ft by 51.6 ft, or 157 m by 26.2 m by 15.7 m.) These proportions are ideal to balance the demands of sea-kindliness, hull strength, and stability. The Ark's size is equivalent to an average cargo vessel by today's standards, which is in line with the limits of timber construction. The account in Genesis 6-8 is workable. Even simple requirements such as the height between decks make good sense. The Ark had lower, middle, and upper decks and an additional clearance of one cubit at the roof. This last might refer to an elaborate ventilation system. In contrast, the Epic of Gilgamesh suggests that the Ark was cuboidal, rather than rectilinear. Such a design would have been neither seakindly nor stable. A rectilinear structure would be vulnerable to the shock of wave impacts. A curvilinear structure would be able to deflect the waves safely. Furthermore, any ship designed to stay afloat in the rough seas of the Flood would have a keel. Examination of the ancient war vessels of the Greeks and Romans reveals many common elements that would enhance seaworthiness. They include a tapered bow with a projection below the water line, and a large sail-like projection on the stern. These features would have caused the Ark to head into the wind and fall back before it. The door of the Ark need not have been on the upper level. In fact, the terms used to describe the decks as lower, middle, and upper, rather than first, second, and third, suggest that the door was at the middle level. The door was probably in the stern of the Ark to avoid compromising the strength of its hull. The word usually translated "window" in Genesis 6:16 actually meant "midday" and thus would indicate a series of hatches in its roof. The Ark was made of "gopher wood," an unidentified hardwood, and was coated inside and out with a covering that is translated as "pitch." The term gopher wood appears only in the Flood account (thereby making it a hapax legomenon), and thus the Bible gives few clues to its actual meaning. Skeptics have often doubted whether the technology of shipbuilding in antediluvian times was sufficiently advanced to enable Noah, or any other shipwright, to build a ship more than 500 feet (150 m) long. In fact, modern man cannot know the level of antediluvian technology, because almost all physical evidence of that technology would lie buried under thick layers of sedimentary rock, if it was not destroyed outright. In addition, the recent finds of out-of-place artifacts suggest that antediluvian civilization might have commanded a far higher level of technology than modern archaeologists or even Biblical scholars generally suppose. Tim Lovett suggests that the minimum technology that Noah would have had available to him was that of the ancient Egyptians, which would have been capable of building a wooden vessel as large as the Ark, and certainly within the 120 years probably allotted to the task. One persistent objection is that a wooden vessel 450 feet or more in length would not be able to stay watertight. Lovett answers this objection with his description of the mortise-and-tenon-planking technique that Greek shipwrights used often and to excellent effect as early as four centuries before Christ. In addition, reports persist of a forty-oar Greek galley built in the fourteenth century BC, though neither ruin nor wreck of such a ship has ever been found. While many creationists purport that the reference to 120 years in the above verse was a proclamation that human life expectancy would be reduced following he flood, others believe it refers to the date when the flood would occur - providing a period of warning, during which Noah preached repentance to a world that, sadly, did not listen. (1_Peter 3:20 , 2_Peter 2:5 ) Lovett suggests that Noah began to build the Ark at the same time that he began to preach to his world. Given that the Flood occurred on 17 Bul 1656 AM, Noah probably received God's instruction to build the Ark in the fall of 1536 AM and laid the keel of the Ark in the next spring. Although there have been many claims, the Ark's location has not been verified in modern times. According to Scripture, the Ark came to rest in the mountains of Ararat, which are in Turkey. There have been numerous reports of sightings throughout history, but the region remains largely unexplored. Although the Ark may have been cannibalized or decomposed since the flood, it remains a dream of Biblical archaeologists worldwide that the Ark will be found. The Ark's discovery would substantiate the Biblical account of a recent global flood and God's judgment. Discovering a vessel of that size in Turkey (or other mountains nearby) would lend credence to the Bible's account of the Earth's early history and the catastrophic interpretation of the fossil record. Some believe that they have found the Ark in northern Iran. A Christian archeological expedition found a rock formation that seems to have the same dimensions as the Ark spoken of in the Bible. The formation was discovered in the Elburz mountain range on Mt. Suleiman. Scientists from the expedition have taken slices from the rocks and run tests on them. They figured out that there are wood cell structures within these samples. It is impossible for the expeditioners to ever know for sure whether or not it really was Noah's Ark, but they do know that it was a place of great importance to ancient peoples. Explorers have discovered an ancient shrine near the supposed Ark. Circa 2003 satellite image from Digital Globe's Quickbird examined by NASA as possible Noah's Ark location on Mt. Ararat. There have been many supposed "sightings" of Noah's Ark on or around Mt. Ararat. One of the most famous is that of George Hagopian. 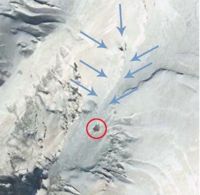 The Ararat Anomaly is basically an object appearing in pictures on the snowfields at the peak of the Mt. Ararat. This object is often considered to be the remains of Noah's Ark. The Durupınar site is the name of a formation located near Mount Ararat, which was named after its discoverer İlhan Durupınar. The size, boat-like shape, and location of the formation have caused it to be put forth by some as being the remains or resting place of Noah's Ark. Most notably, the size of the formation matches the description from the Bible almost exactly. However, most creation scientists do not regard the site as anything more than a natural formation. Although the shape and location of the Durupınar site is very compelling, the object is not unique to the region. There are other similar formations nearby, which are apparently the result of solidified mudflows. Stories of a global flood, and of a favored family that survived it, abound in ancient folklore. John D. Morris collected two hundred such stories and found a surprising number of common elements. Most of the stories collected speak of a global catastrophe, consisting solely of a flood that a god or gods sent to punish the wickedness of mankind. Most stories also tell of a family, forewarned of the flood, who built a ship to save themselves and all the different kinds of animals. More than half the stories say that this ship ran aground on a mountaintop. Genesis does not tell us that every kind of animal came to the Ark to be saved from the flood. God only brought animals "with the breath of life", a phrase that most modern creation apologists associate with land vertebrates (Genesis 7:15 ). One pair of each unclean animal, and seven pairs of each clean animal came on board (Genesis 6:20 ). The majority of the fossil record was laid down during the flood, so there were many more kinds of animals alive in Noah's time. These would include dinosaurs, pterosaurs, marsupial lions, and others; mammoths were almost certainly part of the elephant kind. Noah did not have to round up the animals, because God sent them to him (Genesis 7:2 ). The capacity of the Ark matches estimates of the number of animals kept by Noah that have since diversified into an apparently much larger number of species. For example, the variety of modern dogs are believed to have descended from a single ancestral pair. Dutch Man Builds Replica Of Noah's Ark A man in the Netherlands took two years to build a replica of Noah's Ark. The large boat was opened to the public in a Dutch town and the creator plans to sail it to several European towns. NBC11. April 30, 2007. Noah's Ark Discovered in Iran? A team of Christian archaeologists says this rock outcrop on a mountain in Iran could be the remains of Noah's Ark. Layered patterns in the stone resemble petrified wood, the team says, but other scientists say the patterns are consistent with ordinary sedimentary rock. National Geographic News. July 5, 2006. Explorers of Noah's Lost Ark An entrepreneur is investing US$900,000 to send a joint U.S.-Turkish team to Mount Ararat in July 2004 for a month-long investigation into a boat-shaped structure. June 25th, 2004. Noah by Ellen Gunderson Traylor. It speculates rather heavily on whether antediluvian civilization might have included prominent figures having names that prefigured the classical Greek pantheon, but otherwise tells a story faithful to the Bible about the Ark, its shape, its construction, how long the project took, and its voyage. Ice by Shane Johnson. Noah figures here, too, though not as the central character. Johnson speculates that humans might have stood on average one-third again as tall as they stand today, and therefore the cubit might have been twenty-four inches long, not merely eighteen. The Ark would therefore have been 600 feet long, not merely 450, and hence quite large enough by any standard to hold two of every created kind of land animal and bird (and seven of every kind of clean bird). Johnson also suggests that the "gopher wood" might have been an advanced composite, and the "pitch" likewise an advanced blend of natural resins. Both of these would have been the products of a civilization that, Johnson suggests, was far more advanced than is usually supposed and even more advanced than human society today. Full-sized replica of Noah's Ark, opened to the public in Hong Kong on 25 May 2009. ↑ Tim Lovett, Noah's Ark: Thinking Outside the Box, Green Forest, AR: Master Books, 2008 (ISBN 9780890818075), p. 18-19. ↑ Lovett, op. cit., p. 32-33. ↑ 3.0 3.1 "How big was Noah's Ark?" Creation Tips, n.d. Accessed November 1, 2008. ↑ 4.0 4.1 4.2 Lovett, op. cit., pp. 24-35, 42-45. See also Lovett, Tim, "Thinking Outside the Box," Answers, March 19, 2007. Accessed October 31, 2008. ↑ 6.0 6.1 Miller, Glenn. "Reader's submission on the 'impossible' size of Noah's Ark." Christian Think Tank, June 22, 1997. Accessed November 1, 2008. ↑ 7.0 7.1 7.2 James Ussher, The Annals of the World, Green Forest, AR: Master Books, 2003 (ISBN: 0890513600), pgh. 29. ↑ Kneisler, Matthew. "Mount Ararat: Expeditions Past/Present." The Search for Noah's Ark, 2007. Accessed November 1, 2008. ↑ Kneisler, Matthew. "George Hagopian." in "Mount Ararat: Expeditions Past/Present", op. cit. Accessed November 1, 2008. ↑ Snelling, Andrew. Special report: Amazing ‘Ark’ exposé Creation 14(4):26–38, September 1992. ↑ Morris, John D. "Why Does Nearly Every Culture Have a Tradition of a Global Flood?" Acts & Facts, September 2001. Woodmorappe, John. Noah's Ark: A Feasibility Study. 298 pages paperback. The Search For Noah's Ark contains VRML Tour of the Ark. Noah's Ark Conservapedia's article on Noah's Ark. This page was last modified on 10 August 2015, at 22:33.